Hamp relocated to Tokyo in June. 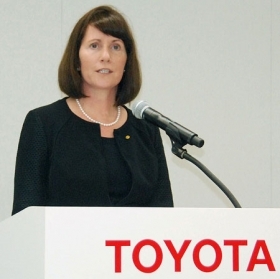 TOKYO (Reuters) -- Toyota Motor Corp. today said Julie Hamp, its first female managing officer, had resigned following her arrest last month on suspicion of illegally importing the painkiller oxycodone into Japan. Hamp, who in April became the automaker's chief communications officer, notified Toyota of her intent to resign, the company said in a statement. Toyota said it had accepted Hamp's resignation after "considering the concerns and inconvenience that recent events have caused our stakeholders." Senior Managing Officer Shigeru Hayakawa will take over Hamp's duties until a replacement is appointed, it said. Toyota declined to give further details, citing the ongoing investigation. Hamp was arrested on June 18 after customs officials found oxycodone tablets in a parcel shipped to her from the United States. Hamp said she did not think she had imported an illegal substance, according to the police. Hamp was appointed managing officer as part of a drive to diversify Toyota's male-dominated, mostly Japanese executive lineup. She joined Toyota's North American unit in 2012 and in June relocated to Tokyo, where she was to be based. "We remain firmly committed to putting the right people in the right places, regardless of nationality, gender, age and other factors," Toyota said in its statement today. The resignation of Hamp, an American, is a blow to Toyota's drive to make management ranks more international and accepting of female executives. It also deals a high-profile setback to Prime Minister Shinzo Abe, who has made empowering women a priority to help modernize and jumpstart the nation's economy, including calling on Japan Inc. to have women in 30 percent of leadership roles by the end of the decade. "Japan Inc. will suffer from this," Jeff Kingston, professor of Asian Studies at Temple University's Japan Campus in Tokyo, said by telephone. Hamp's treatment by the police and local media "sends a chilling message to other foreign managers who might be considering a posting to Japan." From Toyota to Sony Corp., Japanese companies succeeded on the world stage through the 1990s despite maintaining an insular management culture dominated by lifelong company executives. That closed business model began to show cracks as the economy struggled through two decades of deflation, prompting calls for companies to hire and promote outsiders for diverse ideas and skills.